The United Launch Alliance Atlas 5 401 lifted off from Vandenberg Air Force Base in California at 7:05 a.m. Eastern, at the beginning of a two-hour launch window. There were no serious technical problems during the countdown and dense fog at the launch site was not an issue. The Centaur upper stage entered orbit 13 minutes after launch. After a 65-minute coast, the Centaur fired again to inject the InSight spacecraft onto a Mars-bound trajectory. InSight separated from the upper stage 93 minutes after liftoff. InSight will land on Mars Nov. 26 at Elysium Planitia, a site near the Martian equator. The lander is based on the design used for the Phoenix Mars Lander mission flown a decade ago, with modifications such as a thicker heat shield and stronger parachutes to accommodate the faster entry speed of InSight and higher altitude on the Martian surface of Elysium Planitia compared to Phoenix’s landing site near the Martian north pole. InSight is a mission to study the interior structure of Mars, including the size and composition of its crust, mantle and core. “We want to measure the fundamental parameters of the deep interior,” said Bruce Banerdt, principal investigator for InSight at the Jet Propulsion Laboratory, at a May 3 briefing. 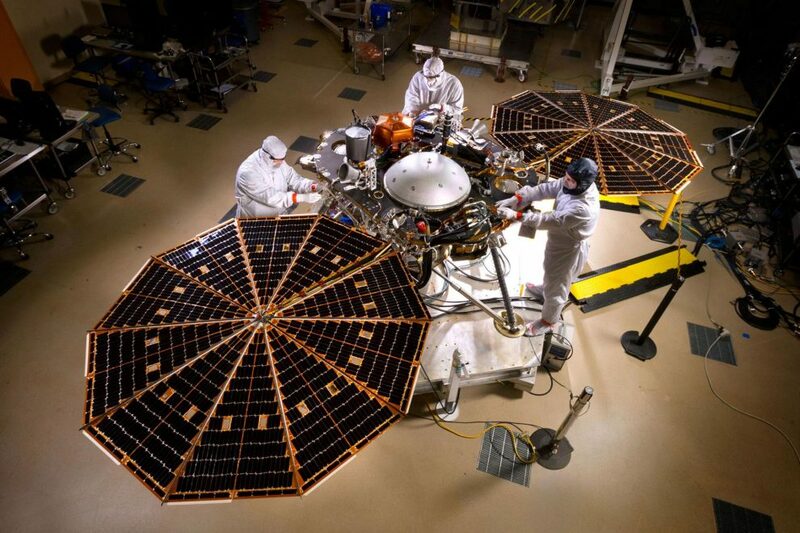 InSight carries two key instruments to carry out that science. One is the Seismic Experiment for Interior Structure (SEIS), a seismometer provided by the French space agency CNES that will be able to measure activity from both “Marsquakes” as well as meteor impacts. SEIS, though, was also a major source of problems with the mission. The instrument is in a container designed to hold a vacuum so that it can precisely measure seismic activity. However, that container suffered a small leak, and efforts to fix it failed in time to allow the instrument to be ready for its original launch date of March 2016. In December 2015, NASA announced it was postponing the launchto 2018. InSight’s second instrument is Heat Flow and Physical Properties Probe, provided by the German space agency DLR. That instrument features a “mole” that will drill about five meters into the surface to measure heat flow from the interior. Besides the two instruments, a third investigation, called the Rotation and Interior Structure Experiment, will use radio signals from the spacecraft to measure perturbations of the planet’s axis of rotation. InSight also carries an Auxiliary Payload Sensor Subsystem to measure magnetic field and other environmental conditions to support analysis of the SEIS data but can also be used for other research. A laser retroreflector mounted on the deck of the lander can be used to provide precise position information. Because the two main instruments are provided by European agencies, about two-thirds of the science team are not Americans. That generated some criticism among American scientists, who felt excluded from a mission largely funded by NASA. He said InSight is planning to address this with a participating scientist program, allowing scientists not involved with the instruments to join the mission as co-investigators. “I definitely want to strengthen U.S. representation on the science team,” he said. That program will also provide an opportunity to allow early-career scientists to take part in the mission. “Given that we’ve been going for eight years, the people I chose at the beginning to be young scientists aren’t young scientists any more,” he said. NASA spent $650.4 million on the InSight mission, part of its Discovery program of relatively low-cost planetary science missions, as well as $163.4 million for the Atlas 5 launch. CNES and DLR spent about $180 million on their instrument contributions to the mission, for a total mission cost of $993.8 million. NASA spent an additional $18.5 million on two cubesats, called Mars Cube One (MarCO), that flew as secondary payloads on the launch. The MarCO spacecraft are NASA’s first interplanetary cubesats. The MarCO cubesats, nicknamed Wall-E and Eve after robots in the animated film Wall-E, are six-unit cubesats ejected from the Centaur shortly after InSight’s deployment. The spacecraft are equipped with UHF and X-band antennas to relay telemetry from the InSight landing as the cubesats fly past Mars. The spacecraft will also demonstrate a thruster system whose propellant is a compressed gas, R236FA, used in fire extinguishers.